MIDI [short for Musical Instrument Digital Interface] is a widely-known communication standard and digital interface. MIDI devices are often simply connected directly via USB or via a MIDI-to-USB interface to the computer. 1] Connect your MIDI device. 2] Set up MIDI and enable your device. 3] Choose how to use the device and incoming signals. ▪ Connect your controller to the computer. ▪ Audio - Activates your MIDI device to be used as audio source [a MIDI keyboard, for example]. ▪ Remote - You can use your MIDI VJ/DJ controller or console to control MADRIX remotely. ▪ MTC - You can use MADRIX to receive external MIDI Time Code. ▪ Watch - Launches the MIDI Watcher to monitor incoming signals or troubleshoot. ▪ You can activate several MIDI devices at the same time. ▪ You can use all options at the same time [Audio, Remote, MTC, Watch]. ▪ Activate your MIDI device as explained above. ▪ Now, the Audio section below will be activated. ▪ Use For S2L - Activates the audio analysis of incoming MIDI signals for Sound2Light effects. This option is activated by default. ▪ Use For M2L - Activates the audio analysis of incoming MIDI signals for Music2Light effects. This option is activated by default. ▪ Channel Selection - Defines which MIDI channel will be scanned and used by MADRIX. - In general, MIDI offers 16 channels. 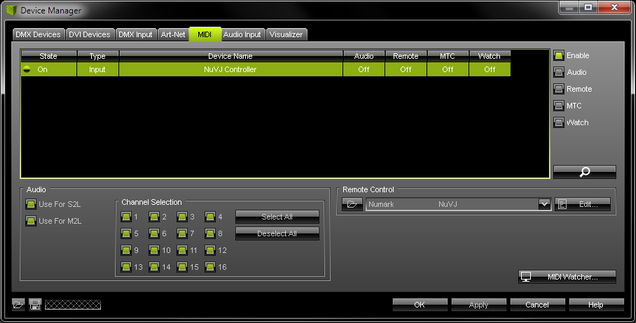 You can configure each MIDI device to send on a particular channel. Make sure that this channel is also selected in this section here. - If you wish to filter a channel, deselect the according number. As a result, the channel will not be used for MIDI-IN in combination with MADRIX. - By default, all 16 channels are activated and will be used by MADRIX. ▪ Now, the Remote Control section below will be activated. Open - Loads a previously saved MADRIX MIDI Remote Configuration file [of the file type *.mmrx]. MIDI Maps - Choose from a pre-configured MIDI map [configuration]. ▪ If you wish to create a new MIDI map, choose USER User. 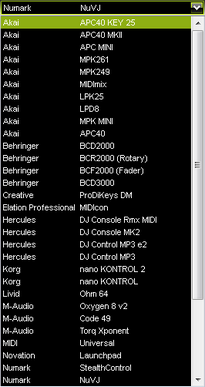 MADRIX includes a number of preprogrammed MIDI maps. Learn more in the following chapters. ▪ Now, you can receive MIDI Time via the Cue List. ▪ It is now possible to monitor incoming MIDI signals. ▪ You can now check incoming signals. ▪ Before using a MIDI device, please make sure that your MIDI device is connected to your computer and that all necessary drivers are installed. ▪ Please also make sure to save your MADRIX Setup after following configuration process.